Both Mount Everest and Mauna Kea are 10km high and neither appear to be in any danger of falling over anytime soon. the Idea is to build a giant tubular-frame mountain 100km high. 100km is the altitude where you'd have to be travelling at orbital velocity in order to get any aerodynamic lift (the Kármán Line). Sounds like a good place to build a few hundred kilometers of mass-driver andor anchor a space-elevator, both free of wind-drag. To mitigate the effects of wind-drag on the mountain itself, hot or cold air is blown through the pipes to expand or contract sections accordingly. Actually, just a huge Eiffel Tower built of composites. Assume for the sake of stability that a 3:1 ratio of base to height is achievable. So, a 30km baseline. Plenty of places in equatorial regions where land is available at reasonable cost. Africa would be favourite. more "ginormous wireframe pup tent" than Eiffel Tower, made of large preformed tetrahedrons or the like, joined at the corners. 100km tall, 300x600km at the base. ^the link's cool, but that's a filled pyramid, whereas this is almost completely just load-distributing frame. But... there's so much room for activities. What happens when the lift breaks down? "My God ! It's full of stairs ! " You could pressurize the inside of the tubes to make them stronger. And live inside them at high altitudes. I thought we agreed elsewhere that the Eiffel shape was the best for a tower. I think that was before my time or during a hiatus. I may have to fall on my sword on this one, but I'd hate to lose [8/7]'s m-f-t: he musta been saving that one up for years. "No, not really. This is a different thing, it's spontaneous and it's called wit. " Oh, Lordy, don't delete this. If only because it explained the Kármán Line to me. And for the wit. 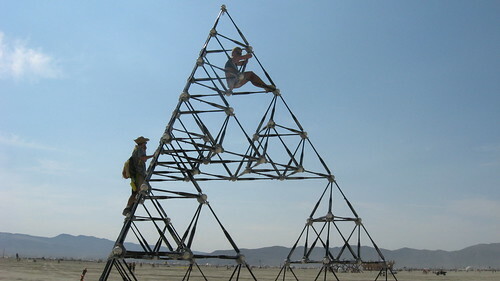 Sierpinski (I can't get the original orthography to work) invented the triangle made up of smaller triangles, somebody at Burning Man made a pyramid. Linky. Now, if you were to construct the entire edifice out of beefed up Segways, then you could move it about to get best positioning. [re: linear accelerator]//straight edge// is fine for short ballistic shots but not for "to orbit" where you actually want to take off horizontally. //[convex] curved// would squish everything to the top of the vehicle with extreme prejudice. re: Sierpinski link: yeah, something like that.